The house has 60 m2. It has the living-room with a tv, a sofa, a table, and a fireplace. The kitchen has everything you need (microwaves, electric kitchen, oven...) and it has a bathroom. Upstairs, there are two bedrooms: one with a bed for a couple, and the other with three beds ideal for children. In front of and behind the house, there are small gardens. There are barbecue and washing machine. The neighborhood has a big swimming-pool from twenty families of 12x7 m and the street is privated. It's 300 m far from Riells beach and the port. The kitchen has everything you need: the microwaves, electric kitchen, oven, toaster, coffee machine, fridge-freezer... The house has BBQ, fireplace, washing machine, terrace furniture (two tables, some chairs...) The private street has a big swimming-pool from twenty familes of 12x7 m. It's 300 m far from Riells beach and the port. 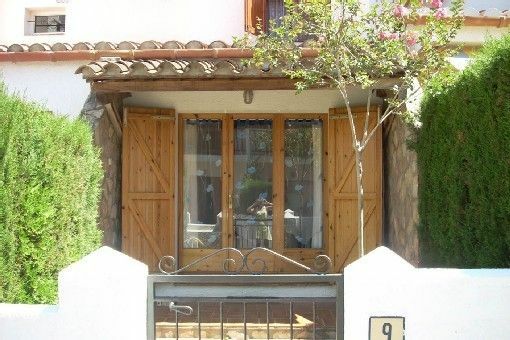 The house is situated in La Costa Brava, in the village of L'Escala (in Riells neighbourhood). It's a quiet village, 35 km from Girona, 130 km from Barcelona and 60 km from the French border.